Here’s what’s up in the world of TV for Friday, September 2 and Saturday, September 3. All times are Eastern. 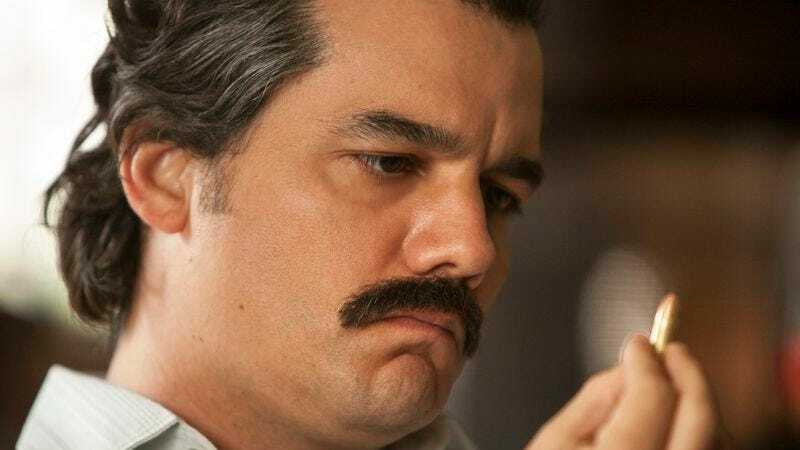 Narcos (Netflix, 3:01 a.m., Friday): When we last saw famed Colombian drug lord Pablo Escobar (played by the Brazilian Kevin Corrigan, Wagner Moura), he was hightailing it away from his prison-fortress La Catedral with the DEA and the entire Colombian army on his heels. What’s a legendary cartel honcho to do with only all the cocaine in the world and lots and lots of guns at his disposal? Prepare to binge, Tony Montana-style, as this excellent series’ second season drops all at once in the wee hours of the morning, possibly wrapped in butcher paper and left taped behind the radiator in that abandoned warehouse by the river. Or it’s easily available on Netflix. Either way, our own Joshua Alston says the show only picks up in power and intensity in this new season, so hold on tight, people. And look for Dennis Perkins’ episodic reviews starting on Friday. Chef’s Table (Netflix, 3:01 a.m., Friday): The third season kicks off of this cooking series that examines the lives and works of world-renowned chefs who make food so precious and pristine-looking, you would feel guilty for wrecking it with your uncouth choppers. This season’s all about France, so get ready to learn the culinary secrets of French masters Alain Passard, Adeline Grattard, Alexandre Couillon, and Michel Troisgros. Eat The World With Emeril Lagasse (Amazon, 3:01 a.m., Friday): Testing further the premise that we as a viewing audience cannot get enough of watching boisterous people eat stuff, here comes a six-episode series of chef, improbable onetime sitcom star, and noted “bam”-mer Lagasse traveling the world and making yummy noises. He’s heading to China, Spain, Italy, Sweden, Cuba, and South Korea, and bringing along other boisterous celebrity chefs like Mario Batali for added flavor. But no “bam”-ing, Batali. Emeril will cut anyone who tries to “bam” on his turf. With a perfectly balanced, very expensive kitchen knife. Possibly from Germany. Kulipari: An Army Of Frogs (Netflix, 3:01 a.m., Friday): Former NFL-er Trevor Pryce may have taken inspiration from his time as a Bronco and Raven in creating this animated series about courageous frogs and turtles fighting off less adorable beasties. (Yes, Pryce was a Jet, too, but that doesn’t really work with the whole animal theme, so back off, okay?) Based on Pryce’s series of children’s books. Abandoned (Viceland, 9 p.m., Friday): The improbably named pro skateboarder, Rick McCrank, hosts this new documentary series where he explores various decrepit places, and presumably does some cool abandoned-escalator grinding. First up: Ghost Mall! Killjoys (Syfy, 9 p.m., Friday): Fans of this scrappy, fun sci-fi series see their joy killed, as the second season comes to a close, with the sexiest space bounty hunters since Boba Fett (or Bossk, if that’s your bag) trying to stay alive and get space-paid one last time. Saturday Night College Football: USC Vs. Alabama (ABC, 8:07 p.m., Saturday): The 11th-season premiere of ABC’s college football showcase comes to you straight from, um, Texas. Don’t question it. College football’s back. “Sorbet,” Hannibal (Amazon): Look, if you’re going to talk about gorgeous, immaculately prepared and presented food like the dainties of Chef’s Table, then there’s a decent chance that one of this season’s four chefs is secretly a cannibal. That’s just playing the odds. At any rate, this year’s French chefs will have to stretch their (possibly evil) culinary skills to the limit if they want to match the stunning (and evil) multiple-course meal Hannibal Lecter serves to a dinner party full of applauding, unsuspecting dopes at the end of this episode.